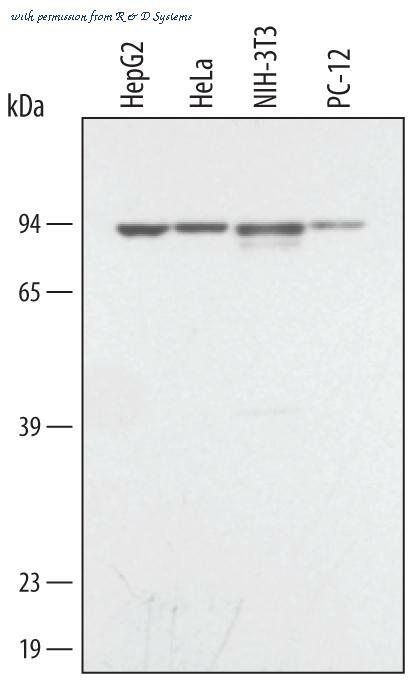 Western Blot of Cy2 conjugated Goat anti-Mouse IgG Pre-adsorbed secondary antibody. Lane 1: Mouse IgG. Lane 2: none. Load: 50 ng per lane. Primary antibody: none. 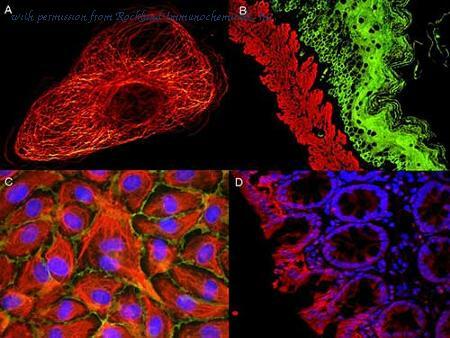 Secondary antibody: Cy2 goat secondary antibody at 1:1,000 for 60 min at RT. Block: MB-070 for 30 min at RT. Predicted/Observed size: 25 & 55 kDa, 25 & 55 kDa for Mouse IgG. Other band(s): none. 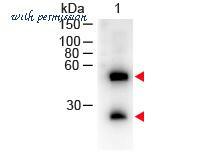 Western Blot of Donkey anti-Mouse IgG (H&L) Antibody Peroxidase Conjugated. Lane 1: Mouse IgG. Lane 2: None. Load: 50 ng per lane. Primary Antibody: None. 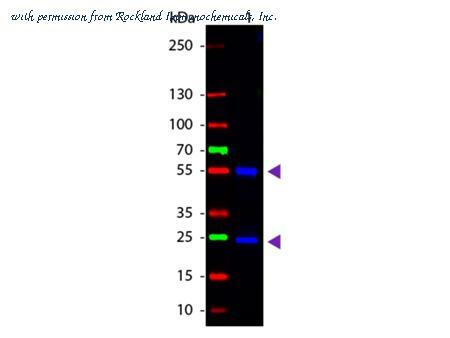 Secondary antibody: Mouse IgG (H&L) Antibody Peroxidase Conjugated at 1:1,000 for 60 min at RT. Block: MB-070 for 30 min at RT. Predicted/Observed size: 55 and 28 kDa, 55 and 28 kDa for Mouse IgG. Other Band(s): None. 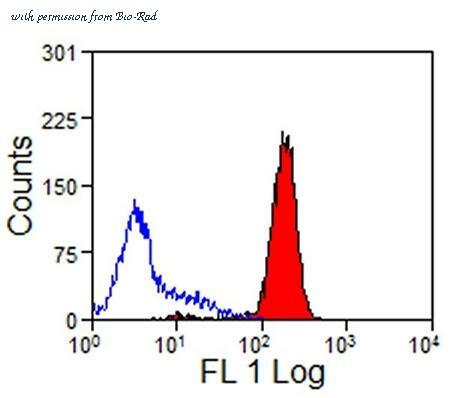 Detection of Mouse IgG Primary Antibody by Western Blot Western blot shows detection of Mouse Anti-Human/Mouse/Rat STAT3 Monoclonal Antibody (Catalog # MAB1799 ) using a 1:1000 dilution of HRP-conjugated Anti-Mouse IgG Secondary Antibody (Catalog # HAF007). This experiment was conducted under reducing conditions and using Immunoblot Buffer Group 1 . 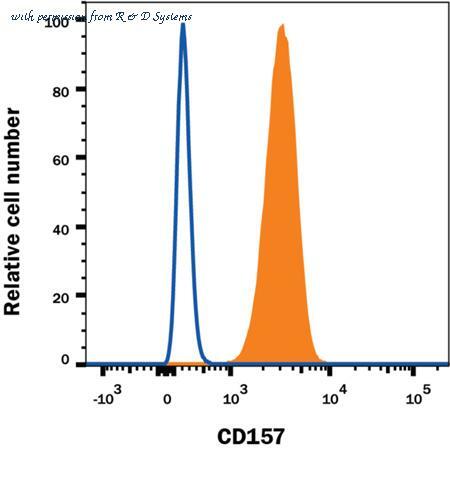 Detection of Mouse IgG Primary Antibody by Flow Cytometry Human peripheral blood granulocytes were stained with Mouse Anti-Human CD157 Monoclonal Antibody (Catalog # MAB47361, filled histogram) or isotype control antibody (Catalog # MAB002, open histogram), followed by Phycoerythrin-conjugated Anti-Mouse IgG Secondary Antibody (Catalog # F0102B) at 10 ╡L/106 cells.